Famigo.com is one of the internet's best resources for Family Friendly Apps! Zippy’s Big Adventures is a fun & interactive game for elementary-age children that improves learning skills while also reinforcing the benefits of personal achievement. In Zippy’s world, the sky is the limit in learning! Zippy verbally guides your child through the learning experience, with reading, spelling and math exercises organized by grade level. As your child answers questions correctly, he/she watches virtual money accumulate in their imaginary Zippy Bank Account. What makes Zippy’s Big Adventures unique is the ability for parents to bridge online learning accomplishments with offline rewards. When your child earns a certain amount of virtual money, allow him or her to “purchase” the new toy they’ve been bugging you about. Or, reward them with a trip to the amusement park once they reach a monetary goal that you’ve decided on together. Not only does Zippy promote scholastic achievement, he also teaches the values of discipline and motivation! 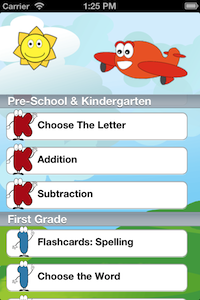 Download Zippy’s Big Adventures and let Zippy take your child’s education to new heights! 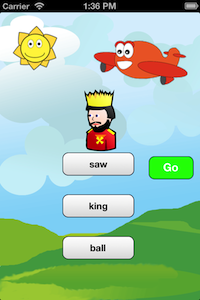 Alphabet Flashcards - In alphabetical order and scrambled with pronunciation. Color Flashcards - Basic colors with pronunciation. Choose the correct color - that Zippy says from three different colors that are displayed. Pick the letter - that Zippy says from three different letters that are displayed. Pick the word- that Zippy says from three different word options. Spell the word- that Zippy says and displayed by typing in each letter. Select the number- that's shown on the die out of three options. 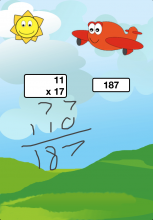 Solve Math Problems- that Zippy asks, ranging from addition to division. + Children using the Letter Flashcards will now see pictures of objects that begin with each letter viewed to help improve their associative skills. + Parents can now focus their child's learning in specific areas by turning off grade levels that are too easy or too hard in the Options Menu (by clicking on the sun image). + New spelling words have been added to each grade level. + Parents can now hear the words that their child is spelling as Zippy recites each letter that their child enters during the spelling exercises.